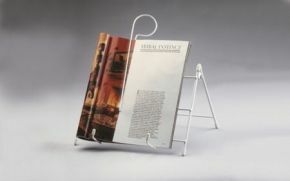 Book and Magazine Stand Lightweight And Foldable. This lightweight, but very stable book stand holds a book or magazines open and upright for reading without using the hands, and can also be placed over the knees. Supplied with a book clip which is used to hold pages open, follow text or as a bookmark. It is also foldable for easy storage.